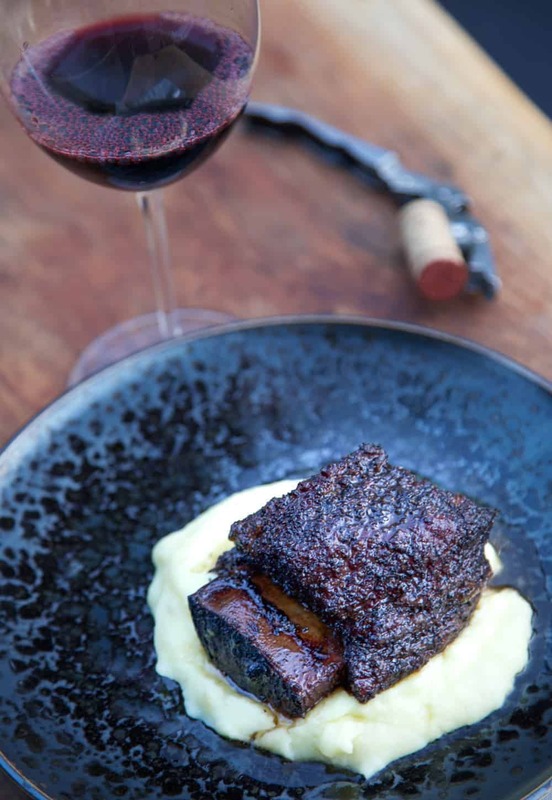 We’re upping our short rib game with this recipe for Smoked Beef Short Ribs finished with a Red Wine Braise. 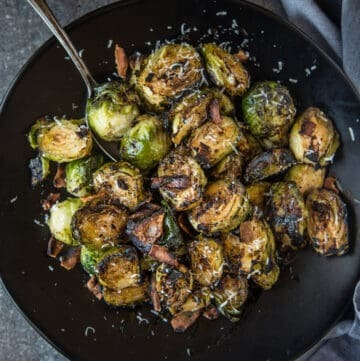 This recipe has dinner party or holiday meal written all over it! 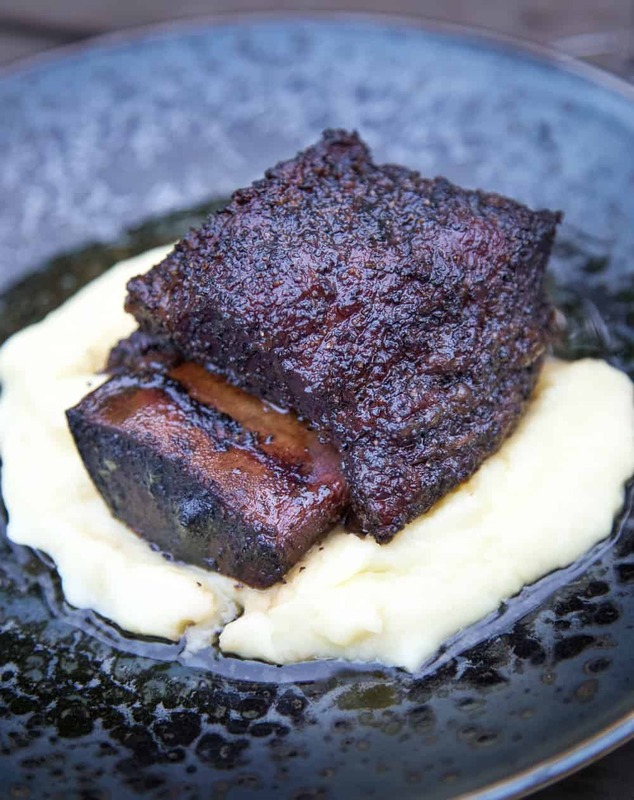 About a year ago we posted this recipe for short ribs saying it was a work in progress. We love to test and test different methods and recipes — different sizes of meats, different rubs, sauces, you name it — until we come to a place where we’re happy. With short ribs, we’ve learned (when it comes to flavor profiles at least) that it’s about what YOU like. 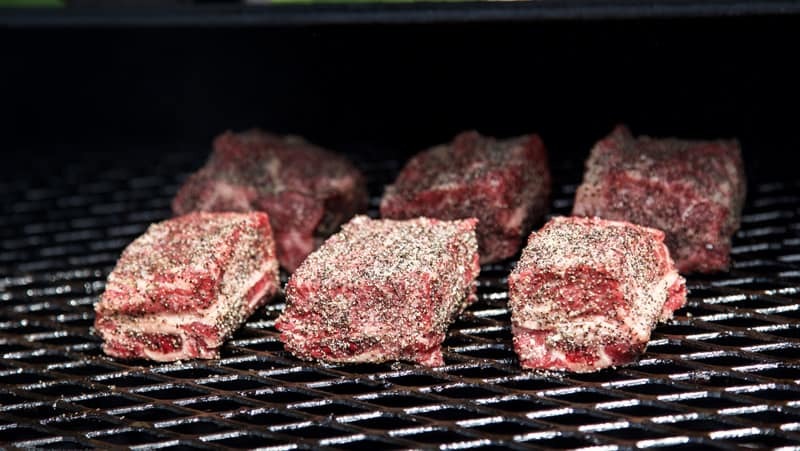 Do you like complex dry rubs on your beef or salt and pepper? Do you like rich sauces, or simple light ones? What it comes down for great meat to is technique. Once you have that down, you can change the flavors easily. 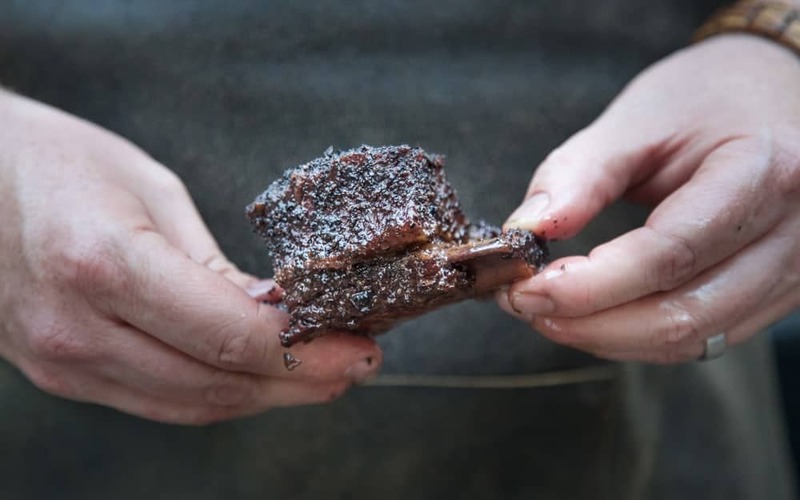 It’s the technique that’s going to give you that melt-in-your-mouth buttery texture that I love about a slow cooked beef short rib. It’s the dish that turned me from a vegetarian to a carnivore, so I have a special love for this cut of meat and always trying to recreate the dish that converted me. Marbling is your friend. 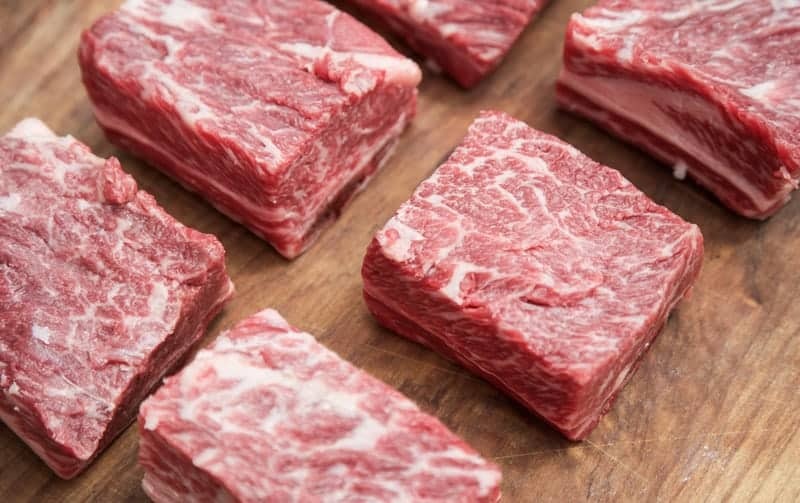 When buying ribs, look for marbling throughout. At the minimum look for USDA choice. Next….size matters. Make sure the bone length is consistent, like three or four inches AND the height. You will often see various sizes of height and that cooks at different times. To avoid an overcooking experience, tell your butcher that you want a specific length on the bone (3 inches) and that they all have uniform height. Or get picky at your grocer, trust me, it’s worth it. Oh, and make sure they are SHORT ribs, not beef ribs! These are two different areas. You want short ribs for this. 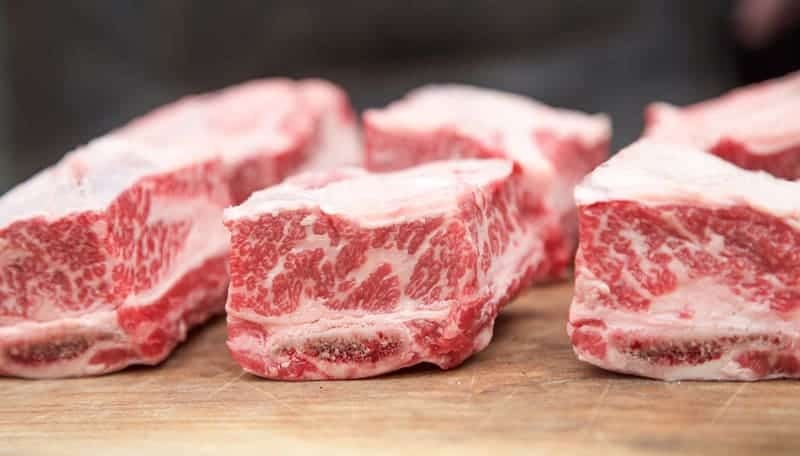 This exposes the marbling and allows your rub to connect directly with the meat, and not fat or the silver skin. It also allows smoke to get at that meat easier than trying to work through the silver skin. With any meat, I add some kind of slather or liquid. This allows my rub to stick. In this case, I go simple with extra virgin olive oil and make sure I coat all sides of the rib. I then follow that with a generous amount of dry rub. And for me, I love beef flavor, so I stick with an equal mix of kosher salt and pepper, to let the flavor of the meat shine. But if you have a favorite beef rub, feel free to use that instead. And be generous when applying the rub because as your meat cooks, it sweats out and you can lose some of that flavor. So don’t be shy. There are tons of methods out there, but ours is about sitting in a bath (or braise) in wine to soak up more flavor. Smoke for a couple of hours getting that deep color. What the short ribs look like when you first put them on the smoker. After about 2 hours of smoking. Look how you start to see the bones and the color changes. Then spritz during the smoke process to add flavor and give the good smoke something to adhere to. You can use whatever liquid you like for this. In our previous recipe we used apple cider vinegar and juice. For this one we’re going with more savory flavors and used red wine, beef broth, and Worcestershire sauce in equal parts. Braise or wrap in liquid. We’re sticking with the wine theme for this one, so we used wine, more broth, salt and pepper, and butter, adding extra flavor into the meat and finish rendering out that fat. Pull and rest once your meat thermometer slides into the meat like warm butter, it’s usually between 200 and 205 degrees F. We like a digital thermometer like this one. Here it is important to focus on the texture, not timing. 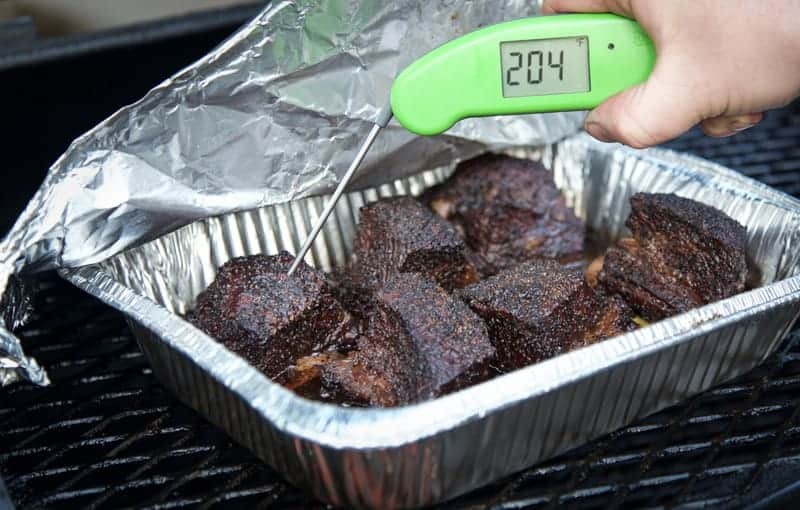 As frustrating as it can be, the rendering is the most important step, so be sure to focus on how it feels when that thermometer probe eases into the meat. Rest for 15 minutes allowing the juices to redistribute, then eat. We are using an offset cooker with fruit wood. I like cherry in this case for color and a sweeter smoke flavor. Oak works well too. I like to run my temp at 225 – 250 degrees allowing more smoke flavor to get into the meat. 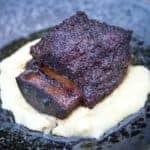 Recipe for smoked beef short ribs and tips and techniques for getting that melt-in-your-mouth tender meat. Preheat smoker to 225 degrees with fruit wood. Trim silver skin off short ribs, coat with olive oil and season liberally with salt and pepper (depending on the size of your short ribs you may or may not use all of the dry rub. Just make sure it's applied liberally based on the size of your meat). Place short ribs on the smoker for two hours and prepare your spritz. After two hours begin spritzing ribs every 30 minutes for one to two hours more. Look for the meat pulling back off the bone and a good mahogany color as the indicator it is ready for the braise. When the color looks good and meat is pulling back from the bone (internal temp of roughly 165 degrees F or 3 to 4 hours on smoke), add to an aluminum pan. In the pan add the braising ingredients: wine, beef broth, dry rub (or salt and pepper), and butter. 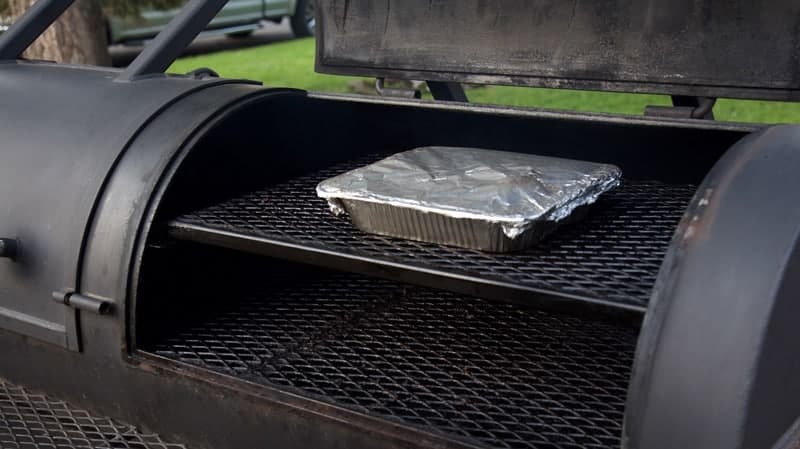 Cover tightly with foil and put back into the smoker. After one to two hours, use a meat thermometer to probe short ribs, the ribs are done when you can insert the thermometer and the feel is like inserting into butter. There should not be much resistance, if it’s not like butter it is not quite done yet, and keep cooking until it is. After you have determined it’s done (roughly 200 - 205 degrees Fahrenheit), remove from smoker and let sit covered for 15 minutes. Remove from bath and serve with your favorite side and a glass of delicious red wine. The texture of the meat is so soft and tender with that amazing infusion. Much of the fat has rendered out, but what you are left with is juicy, melt-in-your-mouth meat. We also let the meat braise in that wine for awhile, picking up some of those concentrated rich and savory flavors. I’m looking for a red wine that has a somewhat rich and velvety texture, with medium to low tannins and deep fruity flavors (not ripe or overly sweet). I want something full-bodied, but not overly intense, and I want some acid to refresh the palate. I went with a Sonoma Valley Cabernet Sauvignon for this. Rich and bold, but not overly tannic, with deep blackberry, black cherry, and blueberry fruit, pepper, vanilla, and toasty notes. It really works well with the richness of the meat. 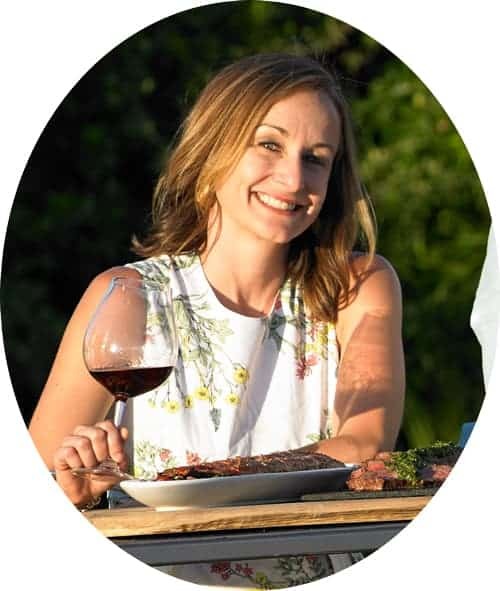 The wine and meat are perfectly in tune and balanced with each other. 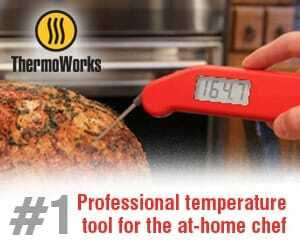 *This post contains affiliate links for the ThermoWorks Mk4 Digital Thermometer. We only recommend products we use and love! And all of the products mentioned above are those we use regularly. That looks amazing. I think I know what’s for dinner Friday night. 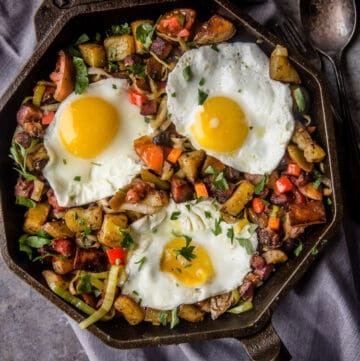 When that first picture finished loading my first thought was immediately “Holy sh*t!” Because it looks SO delicious and this is my DREAM dish! I love short ribs and usually braise in a slow cooker with a rich red wine but smoked looks event better. Seriously your posts, and this one in particular, REALLY make me want to invest in a smoker someday soon. I just use a smoker box from Weber or elsewhere. Works with my gas grill beautifully. It’s my new favorite way to cook. 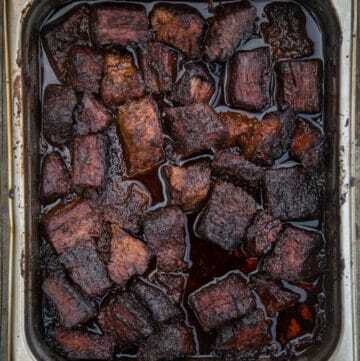 Can you tell me how you can do this in a slow cooker, love short ribs soooo yummy, loved this recipe used in this, but know we are in a garden home and have no place to have a smoker, deck is very small, have a bbq on it but have a slow cooker, nothing any better than ribs. Thanks, if you have the time. Betty, you can definitely do this on a slow cooker. 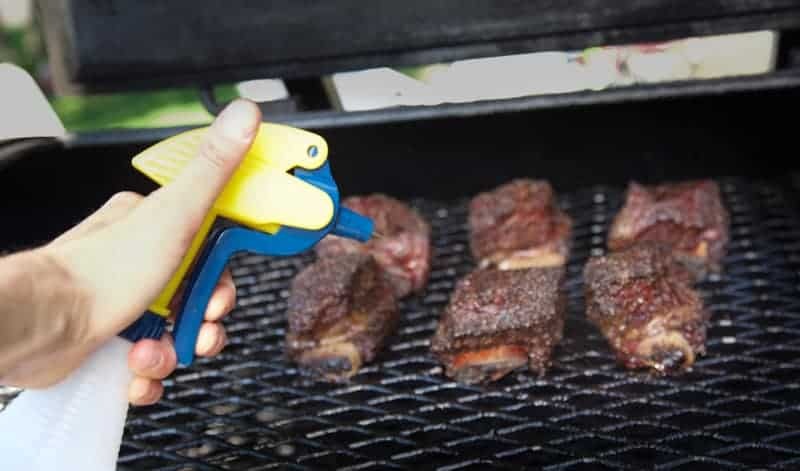 It won’t have the smoke flavor, but I would start by seasoning the short ribs. Then get a sear on them in a dutch oven or pan so you have a crust or bark. Then I would place into the slow cooker with your liquids, taking care to modify the liquids so the ribs are relatively covered. You could add a touch of BBQ sauce that may add a touch of the BBQ flavor, but if you are doing the wine braise, I wouldn’t. Just sear, place in slow cooker, add liquid and slow cook until fork tender. Hope that helps! Wow, these ribs look amazing. Bet they just melt in your mouth. Lovely wine paring. 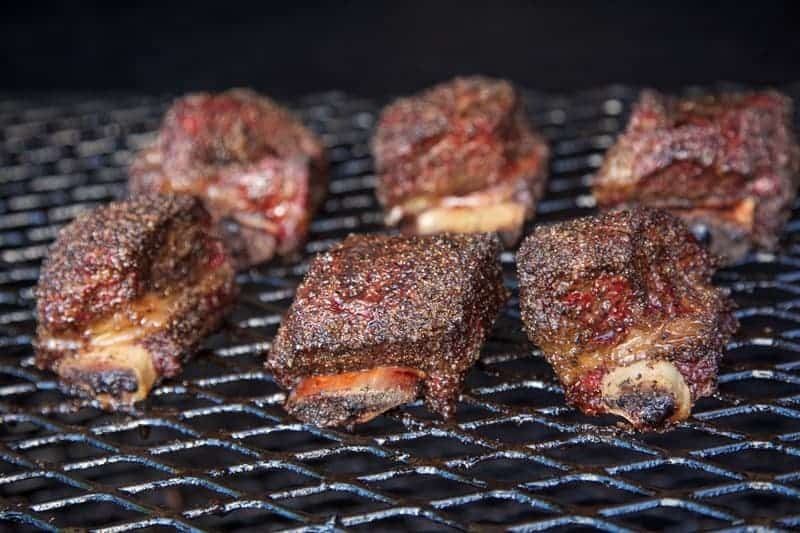 As always, your short ribs look great. I can see the wine was perfect with the ribs. Since diving more deeply into low & slow, I’ve found those big flavored lush American wines are often the best pairing, even though they’re typically not my normal favorites in other circumstances. Congrats on the viral video, amazing! Totally agree! I’m not one to drink lush wines on their own, BUT with the right pairing, heck yes!!! Excellent tutorial on the ribs. I’m going to put it to the test! Looks delicious! 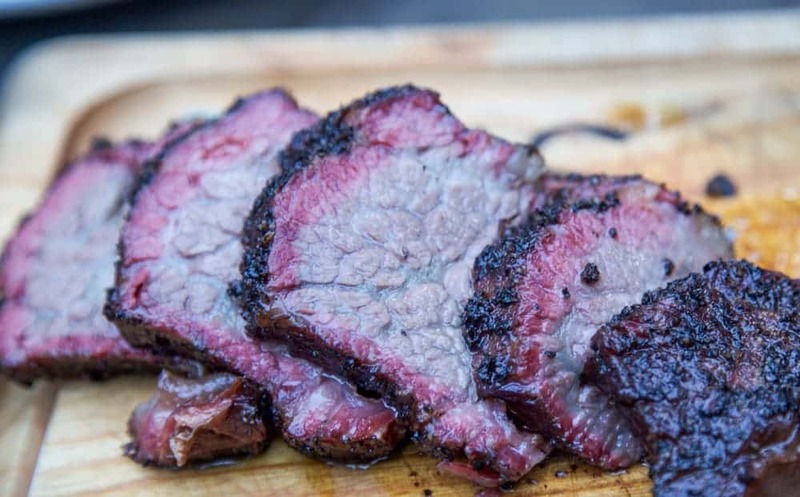 Quick question – do you have the bath in the smoker during the initial smoke phase? My smoker (Masterbuilt electric) has a water pan to keep the humidity up during a typical smoke. I figured I would just put in a foil pan with the bath liquid in instead. Craig we don’t. We add the batch after the food is smoked. One item we are careful with is cross contamination….with raw meat cooking, that juice we avoid dripping into anything (or splattering) into liquid becoming a health issue. If your water pan is separate from meat, you could totally try that, but just be careful of cross contamination. Short ribs are one thing I just can’t turn down. This looks incredible and I love the clear directions. Cheers! If you find that the moisture and humidity in your water smoker is sufficient, then no, we don’t think you need to spritz. Is there some other liquid besides the red wine that you can suggest to go with the broth and Worcester? You could just go extra on the broth if you wanted, and season it until you like the flavor. You could also add just a little juice if you wanted it a little fruity and sweet (like apple juice or other). I wish I had a smoker or even a grill! 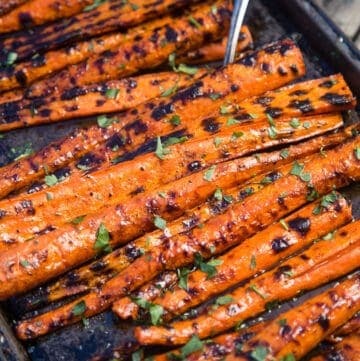 Is there an alternative to cooking these in the oven at all ? Ashlee, first, consider getting a weber kettle grill. Even a smaller size, you can smoke and then put into your oven at an affordable price. But if you can’t or don’t have the facilities to do this, you can slowly braise the short ribs in the sauce. Technique is a little different as you would brown them in a dutch oven and then put liquid and simmer in the oven. Lot’s of option there too online. But maybe check out the Weber kettle! This looks fabulous! What kind of Wood did you use, and once the ribs are wrapped do you need to continue using wood chips? Joann, we use fruit wood. Predominantly cherry or apple, and yes you can wrap and use just charcoal. No need for wood at that point. I’ve never tried making short ribs before, but saw this recipe and just had to try it. We used this recipe for Father’s day, and they were incredible. I came back to here, because I’m working this weekend to incorporate these ribs and flavor into a chili for a chili cook-off at the end of October. Let the testing begin. 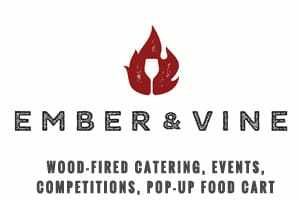 OMG I have to think a short rib chili will be amazing, we’d love to hear your recipe or at least the main star ingredients…cause we don’t want you to give away any award winning secrets :), send photos on Facebook! 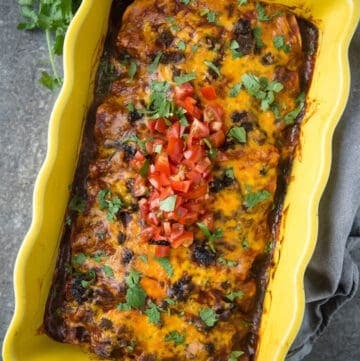 I tried this recipe this weekend and it was amazing. Thank you for posting! One question about the braise – in your video the liquid barely covers the bones but in many braise recipes the liquid covers most or all of the meat. Can you comment on if you have tried with more liquid? We don’t find it’s necessary for this particular recipe. This is because it’s smoked for so long that that aids in tenderizing the meat. When it is in the braise we do flip the meat so that each side gets some of that additional liquid braise. If we weren’t smoking it first for so long, and instead doing it traditionally in a large stock pot, we would cover most or all of the meat like you see in most other recipes. After smoking what is your opinion on doing the braise in the oven? Very doable. We keep it on smoker as we have the wood burning, but you won’t get smoke through the foil. So you can definitely finish in oven. I’m a little confused about the comment to make sure you use short ribs and not beef ribs. I thought that short ribs are beef ribs which are cut from either the chuck or plate? Please clarify. Thanks!! 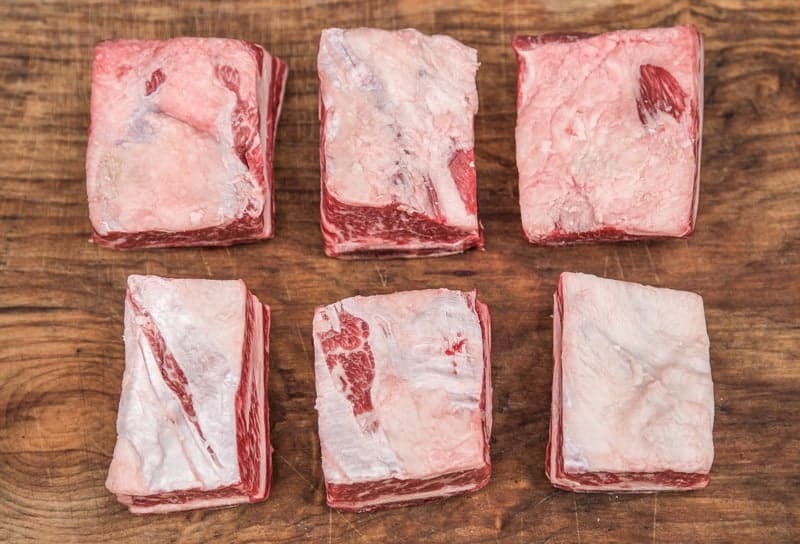 Mike, we use the term beef short ribs as many of our readers are grabbing from a butcher counter those pre cut plate ribs versus going with the entire plate. You could use the full plate and get the same outcome. Thanks for the comment! What are you putting the ribs on(whitish in my browser) when you serve them? Good question. We like to serve them over a puree (parsnip puree, celery root puree, or similar). Mashed potatoes would work well too. Just something to soak up the juices from the meat and wine sauce. Risotto would also work nicely. You honestly don’t need anything, but if you were looking to round out the dish, then something to soak up the liquid would be my recommendation. What smoker are you using? It looks like a Yoder but I’m not sure. Yes, you are correct. It’s a Yoder Chisholm. Going to try your red wine braised smoked short ribs later this week. Just curious, – the wine that you mentioned – is that what you used in your braids or is that what you paired to drink with the meal?? Alan, for that recipe yes, that’s what we used because that is what we had on hand. But you can use any rich red wine that you would otherwise plan on drinking. Avoid “cooking wines”. Do you have a recipe for the parsnip and celery root puree? Not yet! But we’re working on one. Planning to make this over the weekend but the weather may not be cooperative. Have you ever tried smoking the ribs ahead of time and then braising later? Laurie, we have not smoked in advance but the fat content should make that work just fine. In fact when we eat leftovers (yes we have them on occasion) it still tastes just as good. Let us know how it turns out and we can update the blog! Making for company and decided to brave the rain and make the recipe as written. Thank you so much for the quick reply though! No problem! We live in the Pacific Northwest, so we totally get the rain part! Cheers to pushing through!!! Made this last week and found there to be way too much salt and pepper. Love the method, but think I’ll change to a different seasoning (I make my own rubs). Thanks for the feedback, we definitely like savory around here and the type of salt, even the type of kosher salt variations will change the flavor. Best part is next time you’ll be able to add your own rub! This has become one of my staples. I’ve made it several times for the last 2 years and it is absolutely my favorite. My only problem is the amount of time it takes to finish. It really takes about 9 hours. The recipe seems to suggest 6-7. This has caused some frustration. Dave first, thanks so much for the feedback, and thanks for your experience regarding the time. We can update the post to reflect a number of factors including the type of meat you may be using (Select, Choice, Prime, Wagyo, Pasture raised) will absolutely impact timing and adjust as needed.